The thing about America is that it was founded by not just politicians. Our founding fathers were a lot more than that. They were multi-talented Renaissance men. Their talent and interest stretched out into various topics, even into the complicated art of wine and drink making. In the past, the Mount Vernon estate has recreated the peach brandy and the rye whiskey made by Washington. Now, the Thomas Jefferson Foundation has announced that they will be recreating the popular Thomas Jefferson’s beer. 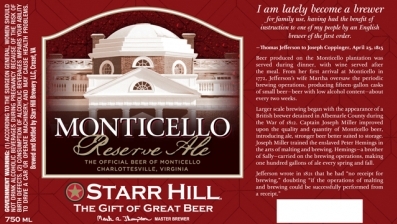 They have also announced a tie up with Crozet based Starr Hill Brewery who will offer Monticello Reserve Ale to the mass audience, thereby ensuring that the Thomas Jefferson’s beer returns.